Where would you find a picture of one of the world's worst genocidal maniacs being used to advertise a newly-opening tourist attraction?.......in Thailand of course!!!! This is one many examples of the lack of cultural awareness or just downright stupidity that is displayed in thailand on a daily basis!!!! It is understandable that the majority of Thai citizens, who have only completed a basic level of education and have not had the opportunity to travel abroad, would lack a certain level of cultural awareness and might make the odd social faux-pas. But the number of supposedly educated Thais, who display the cultural sensitvity of their farming cousins, is mind boggling. This was demonstrated perfectly this month by Khun Somporn Naksuetrong, managing director of Louis Tussaud's Waxworks museum in Pattaya who thought it would be acceptable to use the poster displayed above to advertise his soon-to-be opening attraction in the holiday resort of Pattaya. It wasn't until over 100 complaints had been recevied and both the German and Israeli embassies had personally expressed their displeasure that Khun Somporn agreed to remove the posters!!! And in a typically Thai response, Khun Somporn was happy to pass the buck and blame the advertising agency!!! 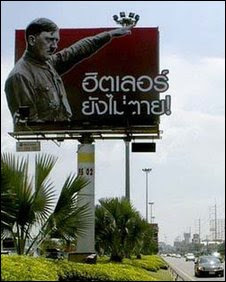 He said: "the creative agency behind the campaign had not intended to cause offence.......We think of Hitler as an important person, but not in a good way. In the museum we don't show him with other world leaders, we show him in the scary section." So by showing Hitler in the "scary section" along with Dracula and Werewolves that makes this insensitive blunder acceptable!!! And just to show that he had learned his lesson........Khun Somporn said they would keep the promotional concept, but "come up with another famous deceased person to replace the German dictator". And I wonder who that might be......Pol Pot, Stalin, Vlad the Impaler!!! However, I may be doing Khum Somporn an enormous injustice......as this maybe a clever marketing campaign based on the mantra that "any publicity is good publicity" and using the furore to boost ticket sales!!! Because I doubt that the opening of Louis Tussard's museum in Pattaya would have made it on to the BBC website or warranted an article Bangkok Post, if there hadn't been the level of controversy!! !